Ohio Voice Data Cabling (OVDC) is committed to giving exhaustive attention to every project we assume, regardless of size. When looking for a company that offers services relating to network and telephone cabling, each and every business we serve can expect unsurpassed professionalism and care from our team of experts. We strive to preserve partnerships by connecting with our customers in an authentic manner. The cabling of office environments, supply chains, retail, and data centers necessitate meticulous planning, knowledge, and careful forethought. It is important to realize that voice and data cabling form the underpinning of an institution. Structured cabling systems are described as an aggregate cabling system coupled with the associated hardware that offers a telecommunications infrastructure. This is the type of substructure that performs an extensive range of uses. Some of these services include transmitting data from your computer network or telephone services. Structured cabling systems are further defined in relation to ownership. This means that a structured cabling system starts at the point whereby the SP (service provider) terminates. These are the points known as the MPOE (main point of entry), demarc (demarcation), or NID (Network Interface Device). The appropriate cabling type for your business will be determined by various considerations. Some of the most significant determining factors will be current or future bandwidth needs, the network environment, and your budget. Our field technicians and network engineers possess the knowledge to ensure your business is provided with exactly what you need from your system, efficiently and within your means. OVDC only makes use of the best manufacturers that ensure that your data and network installations will operate immaculately for many years. 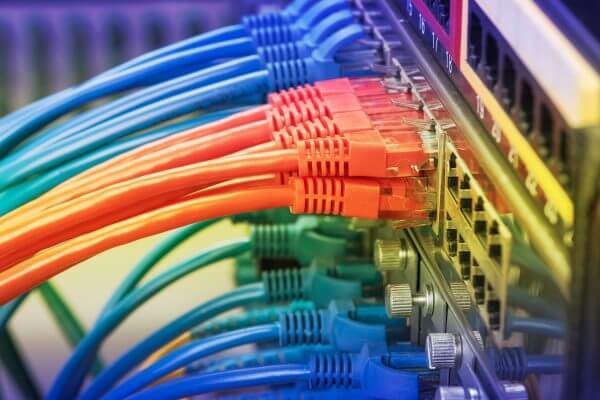 We offer service and installation of copper network structured cabling systems that include Cat 5e, Cat 6 and Cat 6a. Today copper is regarded as one of the most cost-effective methods in building data and voice networks. Cat 5e is viewed as an industry standard and supports 10BASE-T, 100BASE-T, and in some applications, 1000BASE-T network standards. It supports the networks that run at 10 Mbps as well as networks that operate at 100 Mbps. In the majority of applications, Cat 5e is currently the preferable and more suitable solution to Cat 6. This is because it performs similarly as well and is a lot more economical. However, when you are sure that every component in your network is 10 Gigabit (10GBASE-T) or the data volume that is transmitted requires 10 gigabit performance, Cat 6 is a more viable option for your business. This is provided the cables don’t exceed 164 ft. in length. Cat 6A will transmit at 10 gigabit up to 328 ft. It’s also important to note that many businesses are moving to cloud based servers. In this scenario, it is the speed of their internet that is relevant. This further reduces the necessity for Category 6 cabling. This solution is often seen as more useful for the transmission of CATV, another cabling service that Ohio Voice Data Cabling offers clients. Network cabling is viewed as a transparent yet extremely critical commodity for the operations of just about any type of business today. In the center of each type of commercial facility will be a computer network that connects various computers to one another, the internet, along with a number of other hardware and peripherals. For this reason, the wiring that is used to connect these devices has to be of the highest quality. To be sure this is the case in your environment, use a reputable, insured organization such as OVDC to assist you every step of the way. The fiber optic cable is mainly associated with cable television, telephone systems, and the Internet. To describe this product better they are lines that consist of strands made up of “optically” pure glass which carry digital information. Each strand can be compared to a strand of human hair, and when they have been arranged into a bundle, they are known as optical cables that perform the function or transmitting light signals that can travel over long distances. These optic fibers will generally be coated individually in a plastic layer and then encased in protective tubes to meet up to the environment that they will be utilized in. One of the concerns related to outdoor cabling relates to protecting the fibers from water contamination. In these applications, copper tubes opposed to lightweight plastic will be used accompanied by water-absorbing powder or water-repellant jelly.